according to statistics,, today use the Internet more 2 billion people. I.e, about, every third earthling regularly goes online and visiting a variety of resources. However, this is not the limit, as the World Wide Web is growing steadily, and the number of users increases exponentially. People are becoming so much, that register each computer on the network will soon become impossible. And here comes to the rescue NAT (Network Address Translation) - NAT technology. For, to better understand, how does it work, let's consider, how the computer communicates with the Network. each computer, included in any network (including Internet), has its IP-address - a unique number, by which we can determine its location on the network. IP-address system for a long time worked perfectly, as the address of a computer coding format allows to create about 3,3 billion unique numbers. However, current trends are, that the number of Internet users will soon exceed the number of possible addresses, and then "neuspevshie" simply can not connect. For this purpose and need NAT. NAT technology is, that integrate computers into small LANs, each of which is assigned one IP-address. ie. NAT router with the aid allows to connect local area networks to the global. As a result, under the same address will operate multiple computers, which in turn makes it easy to "jump" to the limit 3,3 billion addresses. Another advantage of NAT acts security. Technology can simplify administration and to achieve a higher level of security. All computers on the local network connected to the router. 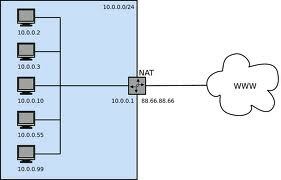 NAT assigns LAN external IP-address. In this case, the address of each computer, included in the network is hidden. When a user receives a packet from any computer, connected through a NAT, he sees only the NAT network address. But sees its own address of the computer. NAT-PMP technology to automatically configure the router, to external sources can communicate directly with a specific computer network. It is necessary for the stable operation of the Internet some of the programs.